Place the potatoes and salt in a pot with water and cook until firm, but not too soft. When ready, drain the potatoes and carefully transfer to a deep serving dish. Let cool. Add the diced bell pepper, tuna, peas and chopped egg to the dish with the potatoes. In a separate bowl, combine the cream, mayonnaise, mustard and vinegar. Add salt if necessary. 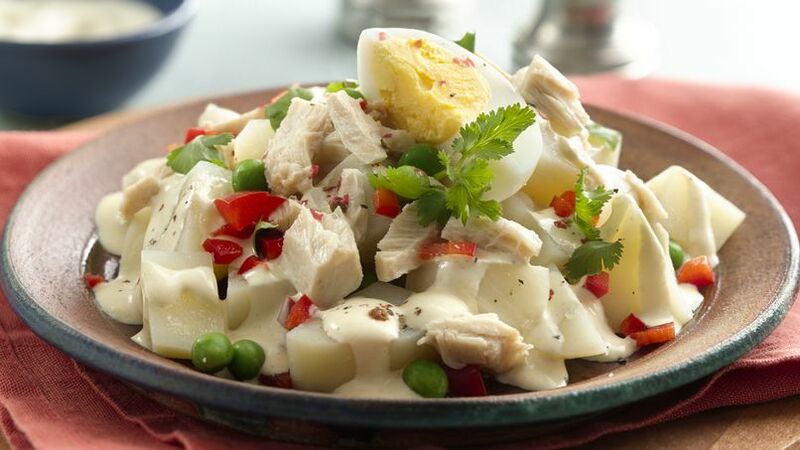 Dress the potato salad with the sauce and place the completed dish in the refrigerator until well chilled. When time to serve, sprinkle the chopped cilantro over the salad. The sauce from this recipe is so delicious that you can also use it in other dishes, like a savory pasta salad. In hot climates we crave fresh foods and easy recipes, just like this salad. Most of the ingredients already come prepared and we only have to mix them and add a little sazón. The traditional recipe only uses mayonnaise as a dressing, but after you try this version made with table cream I think you’ll consider always making potato salad with tuna this way!